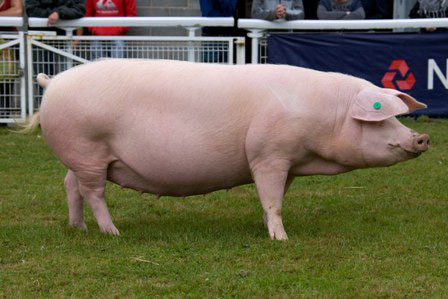 Welsh Pigs are large white pigs from Wales. They are known for their hardiness in extensive farming. They have a long, pear-shaped body. Welsh Pigs were first seen in the 1870s, and is the third most common sire in the U.K, after the Large White and British Landrace. Welsh pigs are not exported to many countries around the world despite the fact that they can produce excellent bacon.